A delicious unison of pomegranate, elderberry & lemon juice in sparkling spring water. A touch of raw cane sugar. 80mg of organic energy from a unique blend of organic guarana, green tea, ginseng and raw coffee bean extract. The organic way to refresh and re-energise yourself. Contains 80mg of caffeine per 250ml.You must be 16 years or older to purchase this product. 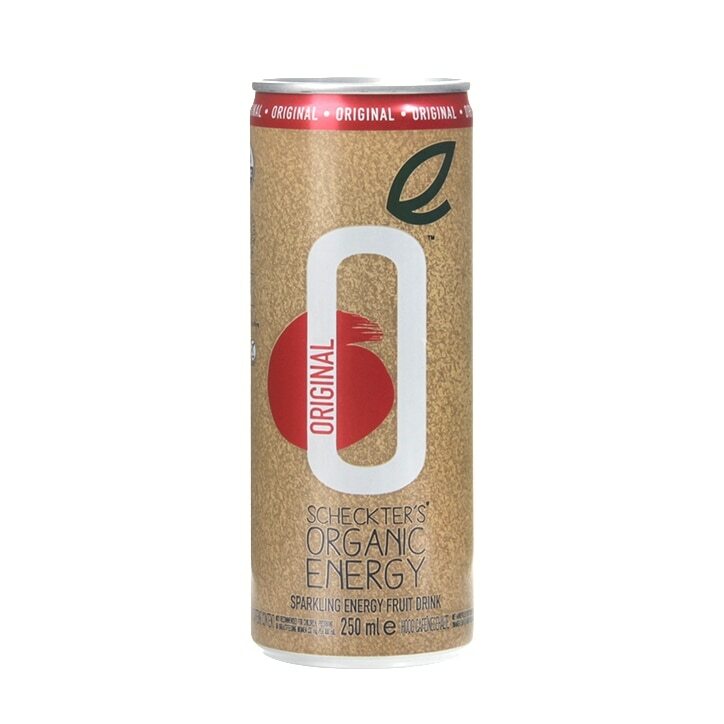 Each can of Scheckter's Organic Energy contains the perfect combination of organic and natural ingredients to provide sustained energy deliverance. The benefit of our particular blend of 100% natural ingredients is that the energy from the ingredients of the organic energy drink are released slowly over a longer period of time, creating a sustainable energy lift that avoids the short lift and sudden 'crash' of other energy drinks. Sparkling filtered water, organic raw cane sugar, organic lemon juice,* organic pomegranate juice,* organic elderberry juice,* organic guarana extract, natural flavouring, flavouring: caffeine, organic green tea extract, organic ginseng extract. *9% organic fruit juice from concentrate. No synthetic caffeine, artificial sweetners, artificial colourants, artificial flavourings, preservatives or toxic chemicals. Scheckter's Organic Energy is rated 4.8 out of 5 by 5. Rated 4 out of 5 by Maim56 from Fizzy pomegrante juice taste Tastes like fizzy pomegranate juice-quite sweet but not too sweet which makes it perfect. I don't know whether it increased my energy levels, I think I will need to buy the product again in order to get a better idea. However, I will definitely buy this product again. Rated 5 out of 5 by Kingdom from Great Product This is a great natural energy drink and definitely seemed to perk me up when I had a can! I can definitely recommend!